It's not just hideous mares people are breeding. Even more horrifying are hideous stallions. Much like dogs, most colts need to have their balls off at the first opportunity. Unfortunately, due to squeamishness on the part of their male owners, a delusional belief that the horse is better than he is, or plain old laziness, this often does not happen. Not surprisingly, the inability to get a gelding procedure done often comes hand-in-hand with an educational level most frequently seen in remote portions of Appalachia. Check out these two ads for perfect examples of this phenomenon. Text in red is as written in the ad. Text in blue is my comments. cassanove (were we trying for Casanova?) was a neglect case and I was lucky enough to be his rehab mom but now he needs more. The vet est him around 10yrs old. he is a sorrel tb stallion. unbroke, unreg., ubtattoo'd. 3 strikes and you're out...he needs to be unbreedable. he is litterly I just got an image of a horse throwing carrot bags out of his stall the calmest horse(much less stallion ever)I can put my 22mo old son on him wtg mother of the year and he stands quietly. he stands questly huh? to be saddled even when a mare is calling him from a near by feild. say what? but he does buck when you try to get on him. which is why I put my 22mo old son on him, yes, I am mother of the YEAR! therefore...I say unbroke and needs work. very small re-homing fee applies with agreement. If you are going to pretend to be a rescuer, one rule of rescue is we don't let unfixed males leave the premises EVER. So sell that unbelievably FUGLY blue saddle and call out the vet to chop the balls off this critter. And on to our next example of things that shouldn't breed on. 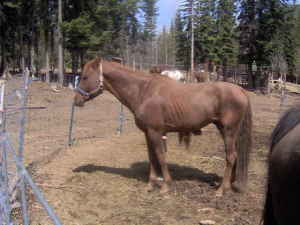 Music Bar Prince (Prince) is a 16 year old sorrel Quarter Horse Stallion. He is gentle and kind and broke to ride. He throws duns and roans and palominos and buckskin foals He "throws" them? That I'd like to see. Only mares can throw foals, asshat. He is a Sugar Bars and Music Mount grandson. No, he is a Sugar Bars and Music Mount great-grandson and that's how far back you have to go to find something anybody has even heard of. He is right at 15 hands tall. Which is important since we know how well SHORT AQHA horses are selling these days (cutting lines excepted, which this horse isn't.) I rescued him last Fall and want to find him a new home. Rescuers geld. If you are "rehoming" him as a stallion, look in the mirror: You are a Horse Dealer. Not a rescuer. I am not into breeding horses and don't need a stallion. Then GELD him! Prince is very gentle and safe around all other horses, little kids, little dogs, goats, sheep, llamas, etc. How comforting to know he doesn't eat llamas for lunch. He leads, loads, and stays in his pen even with mares right next to him. I am asking $400 adoption fee to insure he doesn't get turned into dog food. Horses aren't used for dog food anymore in this country. They are, however, butchered in Mexico for Asians and Europeans to eat. If you are into breeding sporty, agile Quarter Horses, Prince is your guy. Since in 16 years of life, he has so far failed to produce a single point earner in any event. He is still a little thin from being starved nearly to death, but he's gaining well. You've had him since last fall and he's still this ribby...why? He's been wormed and trimmed. Once since last fall from the look of him. I can deliver him for the cost of my gasoline. Because I can't wait to get this thing out of my backyard. Get the vet out YESTERDAY for both of these! Especially the second one, who'll you'll notice is turned out with other horses in the picture. I have no doubt the next crop of straight-shouldered, ugly-necked babies with horrifyingly bad hips is on its way. Maybe we can have a beer together at the auction while we're watching them sell for $50 to the kill buyer? This horse actually wasn't fugly but I have to print the content of the ad as it has so many screaming reasons why this horse should NEVER REPRODUCE. My comments are in blue. 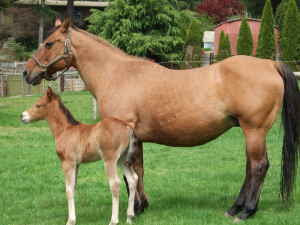 Broodmare or a riding horse for an intermediate to advanced rider? The horses name is Fancy. She is 15.2 hands and 15 years old. I have been told that Fancy was once registered but the papers are nowhere to be found and she has been breed twice before...so I have been told. There is no market for unregistered horses unless they have a show record longer than my arm. This mare should NEVER REPRODUCE. A friend of mine took in Fancy when she found out that she had been abused. Fancy could barely walk and her toes looked like they had not been trimmed for 2 years. My friend had ridden Fancy about 2 years before this day and she was pretty much normal then. Pretty much? Why is it that I suspect this is a lameness of long standing duration? Fancy had been had kept in a stall most of the two years and was badly neglected before my friend got her. After several corrective trimmings, my friend got this horse walking again. Walking? How fucked up was she? Fancy does have problems no, really? but my friend has ridden Fancy in the mountains at Euer Valley (Truckee/Donner Summit area) and feels that she could do it again this year. Since she has finally come sound after the last time we did it, last year! Her vet feels the horse may have a Navicular type condition. Yet another good reason this mare should NEVER REPRODUCE. We don't know for sure because we have never had her x-rayed. Because we are cheap motherfuckers and would rather just dump her on Craigslist. My friend gave me the horse 10 months ago. and now I want $300 because, you know, I fed it some hay. I am really a beginner rider and feel that the horse is best suited for an intermediate to advanced rider. Translation: the lame fucked up horse is also mentally unsound and has tried to kill me and therefore it should NEVER REPRODUCE. I also think the horse would make a good broodmare. WHY? WHY? WHY? What information have you provided here would lead anyone to believe this horse would make a "good broodmare?" I attached 2 pictures of her. One of them is when my friend rode her in the mountains. Let me know if anybody could give her a good home. $300 adoption fee or best offer. You folks out there are breeding too many crappy horses and for too many bad reasons. I am tired of you keeping the kill buyers in business because you need money and think whoring out your horse is going to provide you with some, think your 1/2 mustang, 1/4 arabian, 1/4 tennessee walker is SO fantabulous it should breed on, or you think it'd be cuuuuute to have a baby horse. Yes, I know that we've pretty much stopped slaughter in the U.S. for now, but Mexico and Canada are still killing them at a horrifying rate, and yes, American double-deckers are still going to Mexico and Canada. Now, how do you know if you're a responsible breeder or the kind of person I'm talking about? I'm willing to give some of you the benefit of the doubt and assume you simply don't know what a poor quality, shouldn't-ever-reproduce horse looks like. Maybe you grew up in a town that didn't have a library, so those Sam Savitt conformation drawings weren't available for review. Maybe some other bad breeder gave you bad information and you're relying on that. Maybe you've been living under a rock and you don't know about slaughter, or you're so blinded by love that you simply can't believe anyone would take a colt out of little Precious and cut it's throat? If any of these are the case, you just need some education and I'm going to provide it to you. Pay attention folks, class is in session! If you've ever looked at a mare who looks like this and thought "let's breed her!," YOU are part of the problem. I just don't know quite where to begin here. My guess is someone thought she was a pretty color. This is often the reason for breeding palominos, buckskins, paints, appaloosas, grullas, cremellos, etc. regardless of quality. Lesson #1: Even something that is a pretty color can be conformationally hideous. This is the case here. The only nice thing I can say about this mare is she has a nice shoulder. Unfortunately the negatives far outweight the positives. She is long in the back, has a short, weak croup, a short neck, a huge fugly hammerhead and is post-legged behind. If she's not standing on a hill, she is also built downhill (croup higher than withers). Yes, the baby is cute but all babies are cute. This is a fact. It is not a reason to breed something that will grow up and look like Mom. 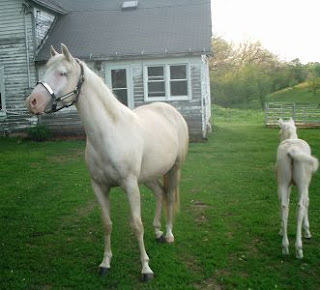 Another example of color over quality, this palomino paint mare has a front end that looks positively deformed, though I'm quite sure she was born that way. She is back at the knee and incredibly crooked. She appears to be a decent mare in other respects, although you can't see everything from this picture, but this is a good example of Lesson #2: Some conformational flaws are deal-breakers. Much like a guy who french-kisses his mother or a car that starts on fire when you turn the ignition key, a front end like this screams "NO!" to anyone with a smidgen of knowledge about horse breeding. Tune in tomorrow for more examples of the Fugly Horse of the Day!